Too often travel review sites only give you a glimpse into someone’s experience at a hotel. For me this is never enough. 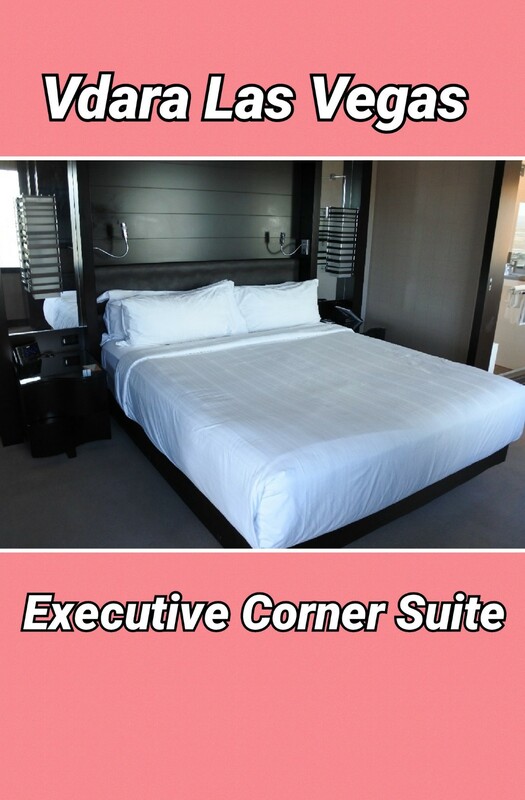 Therefore, I am starting a new feature where I give a more in-depth review of my stays starting with my review of the Executive Corner Suite at Vdara. Vdara Las Vegas is a hotel located in between Aria and Bellagio on Las Vegas Boulevard. This central location is one of the main reasons why I chose this resort. To reach Crystals or Aria is a very short walk from Vdara. Similarly, the walk to Bellagio via a covered walkway is only about 7 minutes. Another main reason that I chose this hotel was that we were traveling as a family on this particular trip. Mr. Smart Mouse and I love Las Vegas. We have stayed at most of the casinos on the Las Vegas Strip over the last 15 years. I had my young daughter with me this time so I wanted a hotel that had no casino on site. 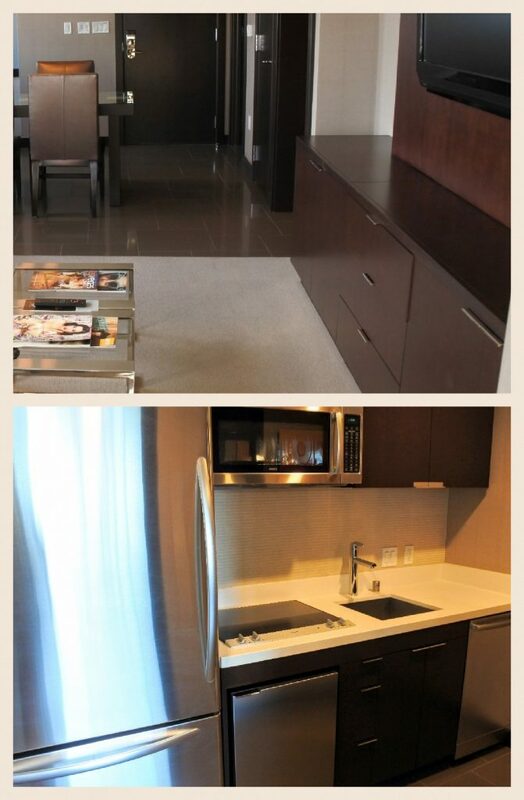 I was also looking for a spacious room which the Executive Corner Suite at Vdara provided. The hotel lobby was quiet (by Las Vegas standards) and inviting. At some Las Vegas resorts there is a large day and night club scene which I hoped to avoid on this trip. Vdara had a great crowd of people having fun without being loud or obnoxious. This room was a stunning 811 square feet with an “L” shape. You walk into the dining area, with the powder room to your immediate left. The next door to the left was the kitchenette. If you continue through the dining area you find the living room with fold out couch. Here the main area ends and you turn left to enter the spacious bedroom and master bath. It certainly exceeded my expectations. The large dining table worked out perfectly to eat breakfast (and once a quick lunch) in the room. The powder room allowed Elizabeth to go to the bathroom in the middle of the night without having to go through the adults’ room and wake us, and everyone could get ready simultaneously in the morning. Since we were ready quickly we could get out and explore even more of Las Vegas. The beds were comfortable. The room was also extremely clean. My only real complaint with the room is that the blackout curtains are not as effective as some other Las Vegas hotels we have visited. On this trip our suite faced west (which helped) with an 8-year-old who is not a fan of sleeping in, so it didn’t really matter much. Our only other disappointment with the room was that although the kitchen was nice there were no kitchen items (plates, cups, utensils) to be found. Check availability and rates directly with Vdara. There was one pool and a hot tub at Vdara. When we arrived the pool was not crowded, but as the morning went on it got busier. 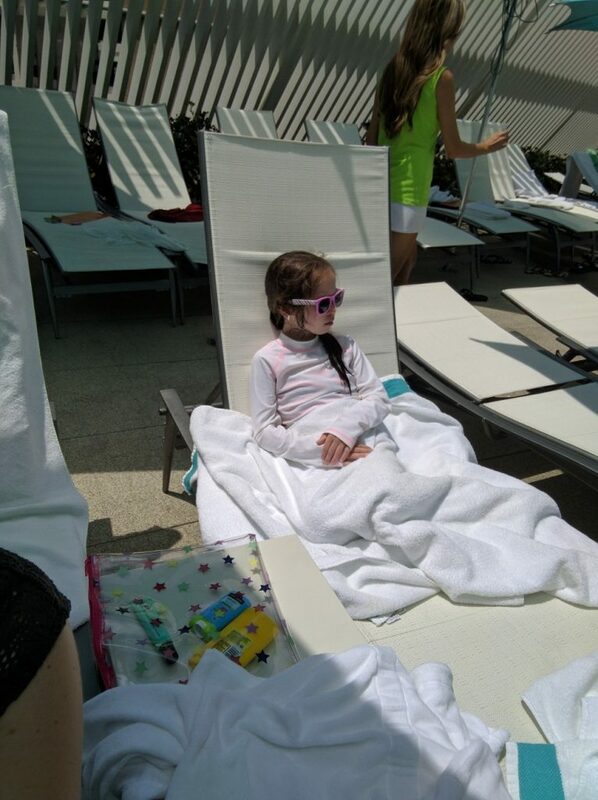 There were attendants at the pool to help guests to find chairs and get settled. I burn very easily so I loved that there were many chairs that had umbrellas to protect you from the sun. We found a table every few chairs. There are also cabanas, day beds, and lounge chairs for rent, but we didn’t bother since we had only a couple of hours set aside for pool time. There were only 3 options for food in the Vdara lobby. I didn’t feel disappointed by this since there were many great places to eat within a 10-minute walk. Market Cafe: You have a few options when eating here. There is a quick service line where you can grab ready made breakfast, sandwich or salad options and eat elsewhere. You may also purchase items off the sit down cafe menu if you don’t mind waiting for a few minutes while they prepare your meal to go. We took food up to the room for breakfast and one lunch post pool time from the cafe. The fruit bowl, although expensive, fed 3 of us on two different mornings. Another option is to have a sit down meal at the Market Cafe. Lastly, attached to the cafe is a small sundry and snack shop. Starbucks: The usual offerings can be found at the Starbucks within Vdara. Vice Versa Patio and Lounge: Nice looking lounge that serves small plates, drinks, and on the weekends it serves breakfast. We did not eat here, so I can’t speak to quality of food. Vdara currently only has a valet option (which I had not known prior to arriving). Self parking can be found at Aria which is nearby to Vdara. We elected to do the valet. Although we were on a road trip I planned to abandon the car and walk or cab during our stay in Las Vegas. We all really enjoyed our stay at Vdara in the Executive Corner Suite. It was a great hotel, near so many of my favorite casinos and restaurants, with great staff and clean, beautiful rooms. I would highly recommend this resort to anyone looking for a little quiet and extra space when visiting Las Vegas. I was not compensated for this review and it represents my honest opinion of my stay. We have been to vegas many, many times and have never heard of this resort! Although we are loyal to one casino/hotel in particular- visit only on grown up trips. I love a good hotel review… the good and the bad!